Xenophobic nationalism has created uncertainty and threat, but also new opportunities, through cultivating the necessary conditions so that public communication can be taken more seriously than before. 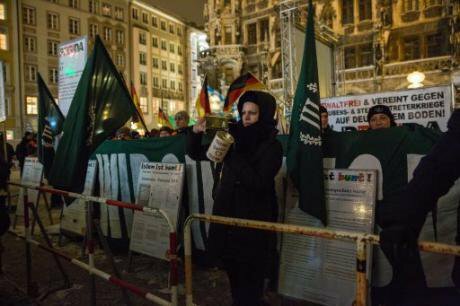 Germany: The far right PEGIDA holds two year anniversary rally in Munich. NurPhoto/SIPA USA/PA Images. Press Association. All rights reserved.The 2008 financial crisis opened up a window of opportunity for challengers to the political status quo: there was the Icelandic pots and pans revolution, the Greek anti-austerity movement, and the Spanish 15-M movement – eventually leading to the emergence of parties such as the Pirate Party, Syriza and Podemos. There were also actors clearly on the other side of the ideological spectrum: PEGIDA and the AfD in Germany, Party for Freedom in the Netherlands, People’s Party in Denmark, the National Front in France, and the Freedom Party in Austria, among others. Of course, one should also add UKIP and its successful Brexit campaign to the list, as well as the election of Donald Trump in the US – and with it, the reinvigoration of the North American ‘alt-right’. The argument that the 2008 economic crisis and its (mis)management is to blame for the rise in these movements does go a long way in accounting for the turmoil. But the extent of this, and exactly how, remains unclear. Leading scholars have ventured various analyses. For Jürgen Habermas, we are essentially witnessing ‘a variety of structural causes and many coincidences’. Others, in turn, provide more ambitious interpretations. Colin Crouch sees in these actors, especially in the rise of right wing populism, the symptom of a new cleavage that is opening between – in the absence of a better name – cosmopolitans and xenophobic nationalists. Finally, Etienne Balibar believes that these changes confront us with the choice between a xenophobic nationalism and “a quest for the “missing people” (Deleuze’s expression), a new synthesis of resistances and democratic hopes”, as expressed in protest events in Iceland, Greece and Spain. If the question of whether these political changes are interrelated – and if so, in what ways – remains unsettled, so, too, does the issue of who is supporting these rising actors. A common answer argues that the ‘losers’ of globalisation are the ones who are fuelling them. Yet it is unclear how these losers are to be defined. Ronald Inglehart and Pippa Norris have recently suggested that it is not economic insecurity that drives citizens to support ‘populist’ parties, but cultural factors. Support for these actors can be understood – in their view – as a reaction against the spread of progressive or post-materialist values over the last four decades or so. The “less educated and older citizens, especially white men” are precisely those who now feel threatened and increasingly marginalised by this cultural shift. Other studies, in contrast, show a different picture and highlight the relevance of economic anxieties – it is not necessarily those worse off who support populist parties, but citizens living in neighbourhoods where residents endure diverse forms of hardship. To some extent, this has also been shown to be the case with regard to supporters of left-wing ‘populist’ actors such as Podemos. While it seems to be agreed that we are not dealing with a revolt of the poor, it remains unclear whether this is a revolt of those facing downward socioeconomic mobility or a revolt of the ‘materialists’ – or both. Yet discourses also matter. The French philosopher Didier Eribon offered an account of why former communist voters now support the extreme right in France on the basis of the discursive shift that took place most visibly after François Mitterrand’s access to power in 1981. Around that time – he argues – the discourse of the leftist parties started to move in a more neoliberal direction, with terms such as ‘autonomy’ and ‘individual responsibility’ substituting for expressions like ‘social class’ and ‘class struggle’. In short, the self-worth associated with the class identity of a group that were self-assured and ready to fight for their interests gave rise to a more atomistic public representation of working-class citizens as ‘losers’ and ‘victims’. It comes as little surprise, then, that in this context these citizens turned to those political elites who seemed to speak to them and for them – with the important novelty that these right-wing populist elites no longer did so in terms of social classes but in xenophobic and nationalistic ones. The latter discourse resonated with the everyday concerns of people living in depreciated neighbourhoods, provided them with a new source of self-worth, and allowed them to vindicate themselves in the face of mainstream discourses that were disempowering them. Accordingly, the rise of right-wing populist actors in France is a revolt of the symbolically excluded. Conservative concerns in the face of social change “have been countered not only with the force of better argument. All too often, the response has been one of moral condescension or even exclusion from official discourse” writes Wolfgang Merkel. The connotation of the very term ‘populism’ seems to corroborate this interpretation; at least in Europe, it clearly denotes irrationality, demagoguery, unreasonableness, and thus works as a way of excluding those deemed populists from the legitimate community of public debate. Furthermore, forms of symbolic exclusion have also been all too visible in the United States, where half of Trump’s supporters were considered “a basket of deplorables”; again, people too unreasonable to be legitimate interlocutors. The Brexit referendum and most recently the election of Donald Trump have radically altered this situation. Now, the concerns and demands of these 'deplorables' cannot so easily be excluded from the mainstream public debate, which is both good news and bad news. The bad news is that many of those deemed 'populists' are indeed racists and demagogues. The good news, however, is that they have managed to intensify public communication on topics such as inequality, the deterioration in living standards, the exclusion of groups of citizens from the mainstream political process, as well as on the grievances of the cultural conservatives – if only to make sense of the political trends we are currently witnessing. Of course, topics such as inequality and exclusion have a long tradition. What is qualitatively new in communication about them is that they are now perceived as linked to an imminent threat; namely, the rise of xenophobic nationalism, the proliferation of protest mobilisations, and the erosion of support for mainstream actors. Furthermore, on the part of public intellectuals, there is growing reflexivity and self-criticism. The view of populism as a 'pathology' is giving way to the conception of populism as a reaction from those 'left behind' (culturally, economically or whatever). These qualitatively new features of communication are also related to a second phenomenon: the success of xenophobic nationalists which has spurred uncertainty. Uncertainty and intensified public communication are two necessary, though not sufficient, conditions for collective learning. By putting forward arguments, new ideas and frames, learning processes can take place – although this does not need to be the case. Uncertainty, in turn, tends to make people more prone to abandon intellectual habits and consider new ideas. Again, whether they eventually do so is an empirical question, not a matter of necessity. In any case, the success of xenophobic nationalism has had the seemingly paradoxical consequence of improving the conditions for collective learning processes. Possible objections to this argument– at least to an uncritical celebration of these new learning potentialities – are straightforward. In general terms, collective learning is a perilous process. After all, wrong conclusions can be drawn, that is, 'learnt'. Yet, on this occasion, it is mostly xenophobic and nationalistic ideas that have intensified public communication and created uncertainty. They, too, shape the public debate and push in specific, unwelcome directions. Furthermore, the kinds of attitudes these ideas fuel tend to neutralise the civic, learning-promoting consequences of communication. The popularisation of concepts such as ‘post-truth politics’ and the denunciation of ‘conspiracy theories’ as increasingly influential are already symptoms of the new forms of fragmentation of the public sphere. The force of counterarguments and alternative ideas and frames is, in any case, being weakened – be it because ‘populists’ interpret them as part of a purported conspiracy, or because critics dismiss them too quickly as ‘post-truth’, or because actual lies are passed off as “alternative facts” in a context where people only communicate with like-minded ones. Of course, it is the introduction of new ideas, arguments, perspectives, and so forth in the public sphere that can lead to new insights– but how can this happen given that public communication does not precisely resemble a rational debate among actors seeking mutual understanding and cooperation? Conditions approaching an ideal discursive situation can be institutionally created. This is the role of democratic innovations such as citizens’ juries, citizens’ assemblies, and deliberative polls – although how to connect these innovations to the broader public debate or the policy-making process is still an open question. In the absence of institutionalised deliberative spaces, public communication can trigger learning processes through various mechanisms. First, collective learning can happen through the recursive problematisation of a situation. This is essentially a negative mechanism: the status quo is criticised and destabilised, thus putting pressure on social actors to reconsider their stances and on policy-makers to make new decisions. The process leading to the abolition of military service in Spain illustrates this. A second, sometimes related mechanism consists of the creation of a window of opportunity for political entrepreneurs. A situation is reflexively criticised, thus contributing to opening up a window of opportunity for new actors who seek to develop and advance political or policy alternatives vis-à-vis the situation or topic denounced. To some extent, this is the case of Podemos in Spain, which benefited from the previous articulation of political discontent by the 15-M movement. Seen through these lenses, the upsurge of xenophobic nationalism has certainly succeeded in problematising and destabilising the status quo and it has to some extent also managed to give momentum to specific conservative actors. Yet both mechanisms are also potentially available to progressive actors. Xenophobic nationalism has somewhat paradoxically contributed to creating new collective learning opportunities by intensifying communication on topics such as inequality and various forms of exclusion, by encouraging reflexivity (on the part of public intellectuals), and by creating the conditions necessary so that public communication can be taken more seriously than before. It has also created uncertainty and threat. Seizing this learning opportunity and meeting the challenges they pose demand the recursive problematisation of the status quo and of the false solutions of xenophobic nationalists, as well as support for new political actors, including new coalitions within established ones, in the belief that the public debate cannot be led and collective learning cannot be enforced, but public communication can certainly be enriched, thus making collective learning more likely.